Good thing the bad guys weren’t trying to get in to the back of the Sands Hall, where a wooden block defeated CES security. I wasn’t going to write this post for a couple of reasons. The first is something I learned in another life as a sports reporter: Never complain about the conditions in the press box, because most of your readers would be happy to switch places. The second is that writing about something that wasn’t a problem feels a little petty and boring. Then Steven J. Vaughan-Nichols of Computerworld posted an op-ed about the security theater farce at CES. He got it mostly right, except that I saw some security dogs and a few extra guards around the Las Vegas Convention Center but he didn’t. What happened was that a couple of weeks before the show, the CES folks warned that they were going to start searching bags and generally implementing stricter security at the show. As Vaughan-Nichols put it, “Many of us wondered how these new security measures would accommodate our usual trade show behavior. Was there any hope of making appointments on time?” You should read his report, but the short answer was that bag checks, particularly for press, were perfunctory at best. 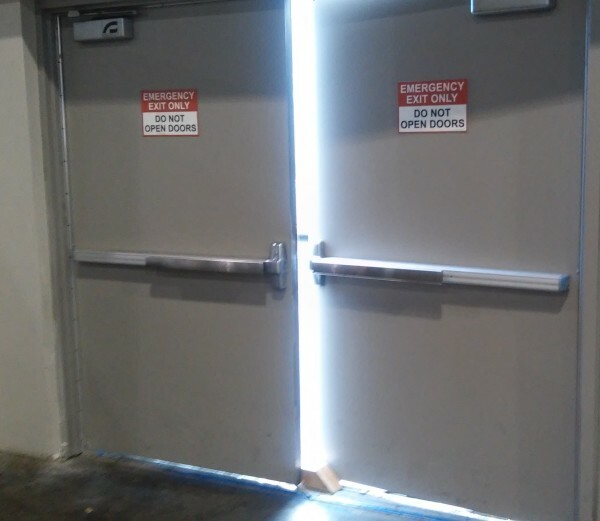 My photo of the back of Sands Hall, where (presumably) some exhibitor had placed a heavy wooden wedge to keep the emergency exits open, should suggest the true security level there. And you know what happened? Nothing! Same as the year before and the years before that, when CES (or the International CES, or the Consumer Electronic Show, or whatever they were calling it at the time) was just as interesting a target for bad guys. In all the years I’ve attended CES, I’ve always felt perfectly safe at its venues. It’s a sad fact that if some moron wants to go on a spree, there’s not too much we can do about it before the fact. But it’s also true that statistically, I’m more likely to be hurt during the drive to the airport or slipping in the shower when I get home. I’m a cynical guy, so I wonder about possible hidden motives. My theory is that the primary goal was to restrict bag size, especially those annoying rolling bags, to keep the exhibit floor area less crowded for the same number of attendees. That would also match the kind of response that Vaughan-Nichols experienced. If so, the plan worked very well, and I’m all in favor of it. I expect more of the same, including its labeling as “Security” to better convince Joe Rolling Steamer Trunk that they’re doing this for his protection. Other news reports focus on self-driving cars and other cool stuff, but CES is always just as much about booths full of phone cases. I’m back from CES (don’t call it the Consumer Electronics Show) for another year. There are so many things to talk about that I figured I’d write a notes column, but then a thought occurred to me: What’s the difference between a notes column and attractive click bait? Laying out those notes as a numbered list. 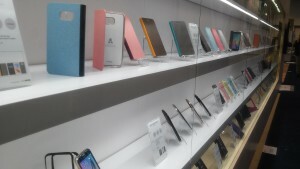 So let me take another step towards modernization with these surprises from CES. 1. CES was as busy as ever. That doesn’t sound as if it should be worthy of a surprise, but its parent Consumer Technology Association had said it was tightening attendee eligibility and cutting out free exhibits passes. Those struck me as Cartmanland-style deliberate scarcity, or maybe just a grab for all that attendee cash on the table. In any event, my pre-show hotel price tracking indicated that demand was at least as high as last year’s record attendance, and my experiences at the show matched that estimate. We’ll get the official numbers any day now. Update: CES reports that the attendee number was about the same as last year, and the number of exhibitors rose by about 5000. That accounts for the increased hotel demand. 2. My one weird trick for Las Vegas transportation still works. Although CES promoted both Uber and Lyft with coupon codes, the best solution to get from McCarran Airport to the Las Vegas Convention Center remains the humble RTC bus. For just $2, less than the airport surcharge for taxis or those rider services, the 108 bus delivered me to the LVCC door. More and more visitors have figured this out, but as usual, there was still plenty of room on the bus. 3. There’s a company called FiveByFive that’s trying to do what Apple TV couldn’t – license enough live TV content to support a streaming platform. Its xFaire device and Beyond DVR service are supposed to bring 4K video to home subscribers, and its mockup demo screens show ESPN, HBO, Cartoon Network, and some local channels, although it doesn’t directly support over-the-air TV. FiveByFive CEO George Tang told me how networks want to support his offering, and that the service would launch later this year. I’d love to see that happen, but I won’t hold my breath. 4. Speaking of Apple TV, Tablo showed off the beta version of its interface for Apple TV. I thought its responsiveness on my Roku 3 was adequate, but the Apple TV version is so much faster that it makes me want to switch streaming devices. The Tablo beta app even includes voice-controlled navigation. I’m eagerly awaiting this release. 5. A company called Aura Media has built a product that I had often stitched together in my head. 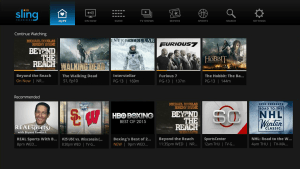 Aura has taken the open-source Kodi Media Center (formerly XBMC) software, added a nicer interface, and plopped it onto a new Android-based receiver with a built-in over-the-air TV tuner. The Aura receiver has all the ingredients to be exactly what the free TV enthusiast wants. I’ll post a full review here once I get a chance to run my sample unit through its paces. 6. Just before the show, chip company ViXS issued a press release announcing that it had introduced the CordCutter TV Stick, “a precedent setting, low cost, low power, small form factor solution to stream free Over-the-Air (OTA) content easily, seamlessly, and reliably to your smart mobile device.” But when I talked with a ViXS VP, he told me they were probably going to be partnering with another company that could bring such a device to market faster under its own brand. Wherever it comes from, that could be interesting. 7. Multichannel News’ CES notes included something I missed: a mention of Tubi TV making a deal with Starz to carry some of its original content. Tubi is a fine, free, ad-supported streaming service like Crackle, and it’s great to see it grow. Tubi wasn’t listed as an official exhibitor, another suggestion of how many meetings and contacts take place in town but outside the show. 8. Although TiVo still sells the Roamio OTA receiver that I wrote about in my previous post, it’s hard to find on the TiVo site. That’s a sign. TiVo now promotes its Bolt ad-skipping receiver as a superset of the Roamio OTA’s features, complete with a new $599 All-In (don’t call it Lifetime) service plan. The Bolt does a ton of amazing things with a great interface, but that’s seriously expensive. 9. Sling TV, of which I am a tiny shareholder through Dish Network, announced an updated user interface to better blend available shows and movies with what’s live. 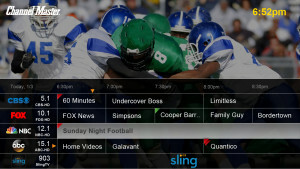 It’ll integrate ESPN3, add strips of Recommended content, and allow the viewer to Continue Watching interrupted shows. (I’m already very happy to see the addition of Turner Classic Movies on demand as part of the Hollywood Extra add-on package.) I’m looking forward to seeing this show up on my devices in the next month or two. 10. And speaking of Sling TV, Channel Master was deservedly excited about Sling TV’s integration with its DVR+. Its version of Sling matches what I see on my Windows Sling app, and the Channel Master folks told me that the DVR+ will continue to pass through whatever improvements Sling will make to its user interface. This free over-the-air DVR and low-cost streaming Sling make a very attractive combination. 11. 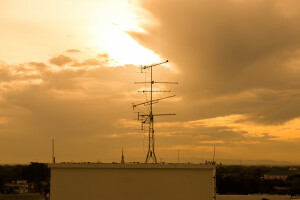 Folks kept giving me TV antennas to test. There was PVC Antenna, whose Magic Stick looks just like a short, narrow piece of PVC pipe with a cord coming out of it. (Its fast-talking president, Omar Naweed, took some time to suggest that this free TV stuff is pretty good before I could convince him that I already know a little about the concept.) The much mellower Josh McDonnell of HD Frequency gave me a Cable Cutter Mini as a competitor to my current pick for best inexpensive antenna. And even Aura Media co-founder Cody Tuma was proud of the little telescoping, magnetic-based antenna he includes with the Aura receiver. I plan to test all of these and post the competition results here soon. 12. A recurring theme I heard from exhibitors is that cord-cutting is real and accelerating. Several reported increased interest in free over-the-air TV over the past year or less. Maybe it wasn’t such a bad idea to change this blog’s name away from FTABlog. What do you think? FreeTVBlog World Headquarters is packed with way too many over-the-air TV devices. Heading into CES, I wanted to provide a quick roundup of the best choices so far for watching OTA TV, recording it with a DVR, and hopefully streaming it to remote devices. I’ll start off with the one major OTA receiver that I haven’t tried – TiVo’s Roamio OTA. Over a decade ago, I used a TiVo to watch OTA and pay TV, and I’ve never held a better remote nor seen a better on-screen interface. The only problem with TiVo right now is its subscription fee of $150/year or (gulp!) $400 for a lifetime. That just feels much too high for a DVR for just free TV, but as you’ll see, it’s really a matter of degree. 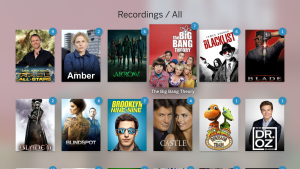 Next up is Tablo, which is the OTA DVR that my family uses. The Tablo has a nice Roku interface, it does a good job when I skip forward while playing back recordings, and its customer service is the best of any company I deal with in any industry. On the other hand, when I connect from my phone for the first time in a week, I have to wait for 10 minutes of “Syncing” before I can do anything. Tablo’s subscription fee is $50/year or $150 for life, which is much more reasonable but not quite free. Simple.TV was one of the first OTA DVRs, and I scored a great deal on a single-tuner unit with a lifetime subscription; otherwise it’s $60/year. That awkward-looking unit actually performs very reliably, though it’s slow to skip around within a recording. Since then, Simple.TV seems to be shifting its attention to the UK, where it was to introduce a cloud-based OTA DVR called ShowDrive. On the other hand, TabletTV continues to make an aggressive push to capture attention for its inexpensive, subscription-free product, as seen in this recent hands-on review. The latest “Plus” version of the app integrates some streaming services, but the app is still limited to iOS tablets, which can already access those same services. When the TabletTV device can stream to my big-screen TV, to my Android phone, or anywhere outside my home network, I’ll be more interested. My old favorite benchmark for subscription-free OTA DVR had been Windows Media Center, which was included in Windows 7 and available for Windows 8. Now Windows 10 has shut the door on WMC, and last July Microsoft switched listing providers, making it a little tricky for users to keep WMC running. My new favorite benchmark for subscription-free OTA DVRing is the DVR+ from ChannelMaster, which just announced that it supports Dish’s Sling TV among its streaming channels. (Separately, Sling TV announced that it’s holding the line at $20/month for its basic package, including ESPN.) Another great thing about the DVR+ is that it works very well with the Slingbox video streamer, through which I can access my DVR+ from just about anywhere. The DVR+ guide and customer service are miles ahead of Windows Media Center and just one notch below Tablo’s. I know that HDHomeRun has been working on its own DVR (a good thing, since I kicked in to help crowdfund it), and other companies may have OTA sticks to show off at CES. I hope to learn more in a few days, and then I’ll let you know.